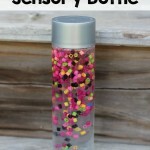 Are you ready to see one of the coolest sensory bottles we’ve made?! 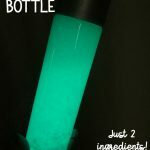 It’s our Glow in the Dark Sensory Bottle! It’s so easy and only needs 3 ingredients! This post contains affiliate links. See my disclosure for details. These mini glow sticks are so cute! And they are such great quality. 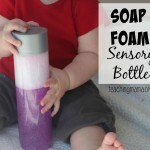 To make the bottle, pour clear dish soap into a bottle until the bottle is 75% full. Then add water until the bottle is almost to the top. 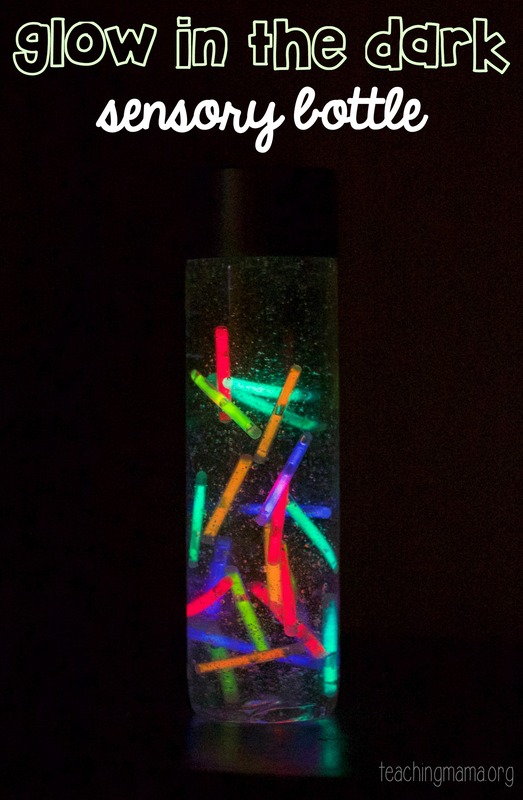 Drop in the mini glow sticks. (Make sure you crack them so that they are glowing!) Glue the water bottle lid on so that little ones can’t open the bottle. 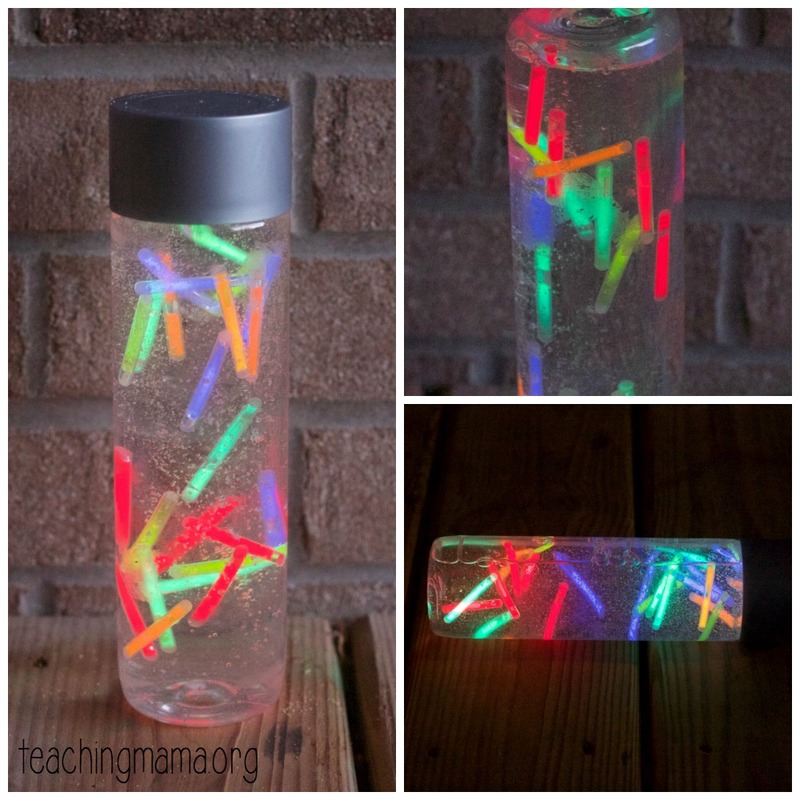 I used dish soap instead of just water because it helps the glow sticks float around the bottle. 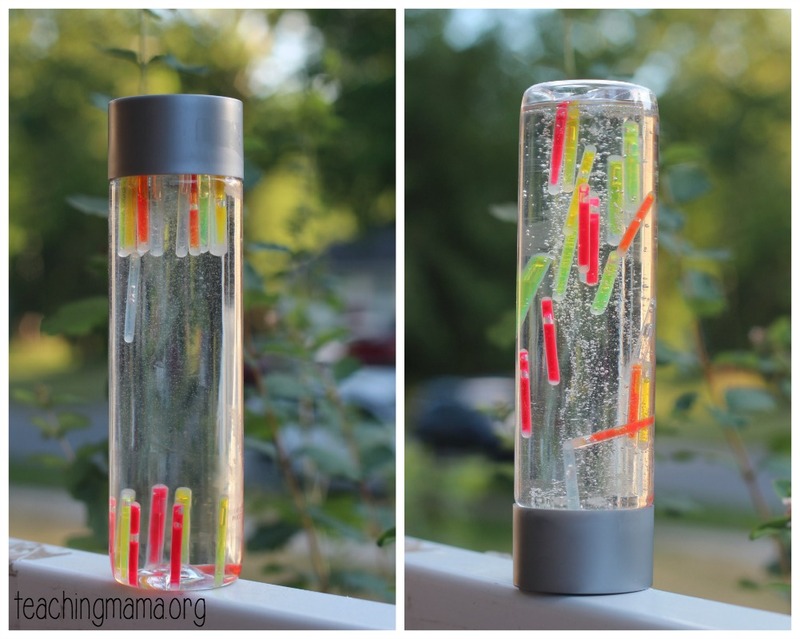 Instead of floating to the top, they float around the bottle. Soap is also more dense, causing it to sink more. On the picture below, you’ll see the bottle at rest (on the right) and what it looks like when you flip the bottle over (on the left). The glow sticks move slowly throughout the bottle. It’s hard to capture on camera how cool this bottle looks! And when it gets super dark, here’s what it looks like! Here’s a short clip showing you what the bottle looks like in action! 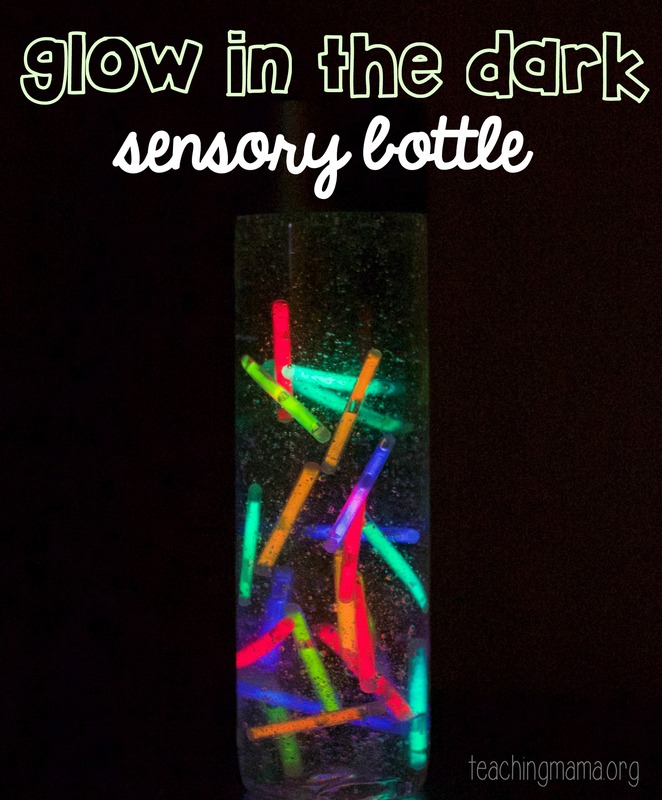 Glow in the dark sensory bottles are so fun! And they make a great night light for little ones. 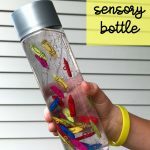 Check out these other fabulous sensory bottle ideas! Oh my! 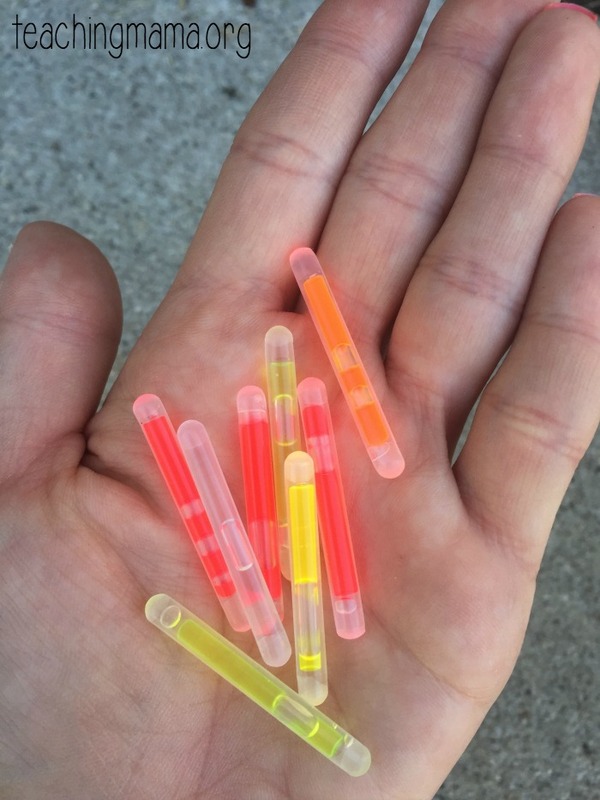 I LOVE these little glow sticks! How cool! how long do the glow sticks last??? Good question! Ours lasted a little over 24 hours. Wish they would last longer! We still have the bottle and it does still look cool, it just doesn’t glow. 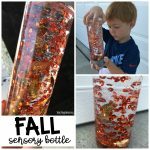 I love the sensory bottle ideas. 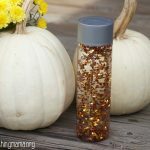 What is a Voss bottle? It is a water bottle. You can find them on Amazon, select grocery stores and gas stations.